The Los Angeles Dodgers are one lucky team. They have the most dominant pitcher that the game has seen in quite a while. Not only is Clayton Kershaw a lefty, but he just turned 26 in March! The NL West is in trouble for a very long time. After his outing last night in which he shut the Colorado Rockies out over 8 innings, Kershaw now has a scoreless streak of 36 innings. He has also won 7 straight starts. Kershaw is now 10-2 on the year with a 1.85 ERA. The lefties WHIP is just 0.87, opposing teams are hitting just .199 against him and he has struck out 115 batters in 87.1 innings. Only having walked 12 batters, Kershaw has a ridiculous K/BB ratio of 9.58. David Price is 2nd in the league with a 9.00 and then Phil Hughes is third with 8.55. 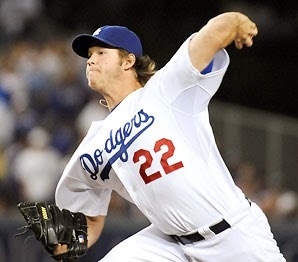 Kershaw has a chance to increase his scoreless innings streak when he takes on the San Diego Padres next Thursday.